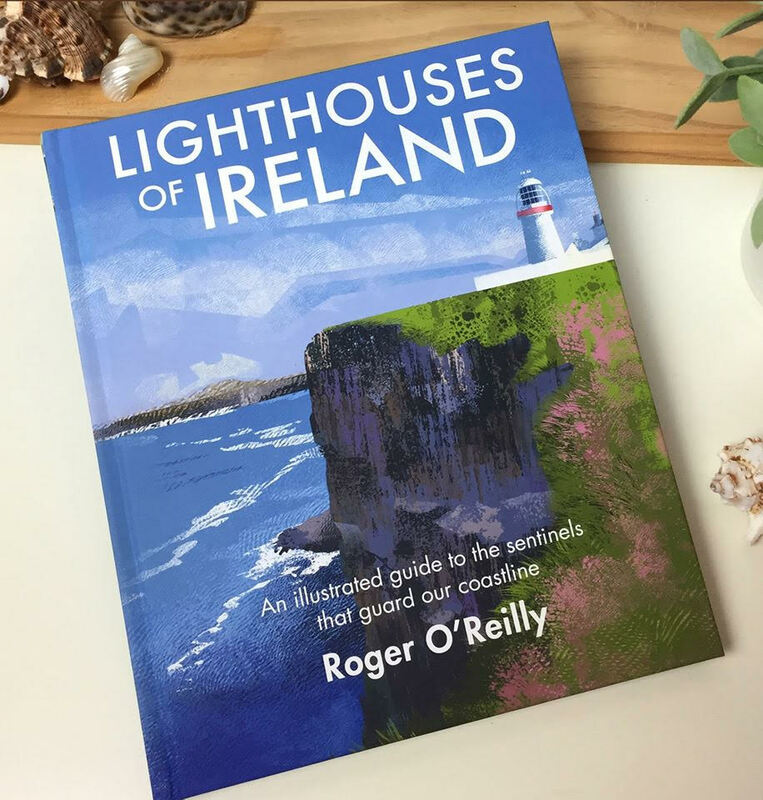 Once again, I am indebted to Redmond O'Brien for drawing my attention to one of the lost lighthouses of Ireland. Hunting out lighthouses is very satisfying and it brings you off the beaten track but the discovery of a lost lighthouse is very rare and, for an anorak like me at least, very exciting. Redmond drew my attention to the Speed map of Ireland (above) drawn in 1610 and pointed out the candle holder symbol - rather like the Jewish menorah - located nearby, asking if I knew anything about it. 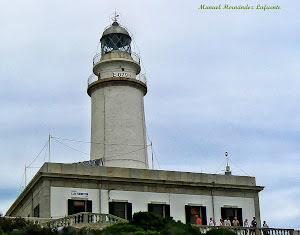 As it happened, I had looked at the map a long time ago and come to the conclusion that this symbol did not represent a lighthouse based on the evidence that, though there were several of these around the coast, many more lay inland. 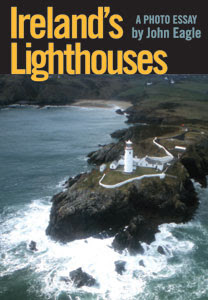 And, obviously, what would be the point of a lighthouse in a landlocked county? 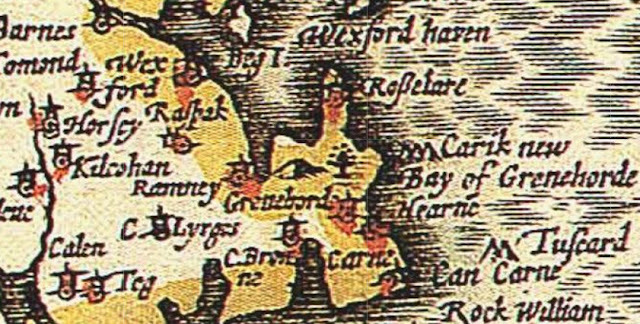 However, prompted by Redmond, who suggested a location just north of Rosslare Golf Club, I did a bit of digging and came across the lost community of Rosslare Fort, situated at the end of a long spit of land that jutted out into Wexford Harbour from, yes, just north of Rosslare Golf Club. There is a great deal of information on this place on the fantastic Rosslare Fort website, which I couldn't possibly reproduce here and why would I need to? 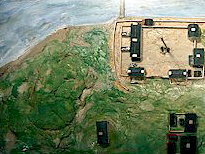 The first written mention of the fort is actually 1599, when it appears on an earlier map. 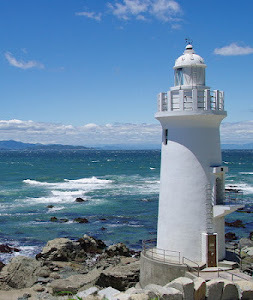 Due to its position at the mouth of the harbour, a navigational light would seem to be a necessity and the suggestion is that this was a wooden structure, located, naturally enough, at the very tip of the spit. It is not known for how long it operated but it was certainly no more in the early 1800s, though its circular foundation was still visible by the end of the nineteeenth century. A strong fort was erected by the native Irish as the threat of a Cromwellian invasion increased, with nine big guns trained seawards to dispel a naval attack. Unfortunately, they were attacked from the landward side. The men tried to escape in a boat and, after a short battle, were sunk. The women and children left behind were rounded up, marched down along the spit and murdered. In the 1800s a lifeboat station was set up at the fort which held up to fifty households at its height. A perch light was established on one of the large dunes. The village and lifeboat station survived until 1925 when the sea breached the spit and washed it away, creating an island. The village disappeared under the waves shortly thereafter. However, recently, the sea has receded to such an extent that, at very low tides, remnants of the conurbation can sometimes be seen. Below, a map of Rosslare fort. I am indebted to Redmond O'Brien - how much more Wexfordian can you get? - for alerting me to the unusual green buoy marking the danger of the Ballast Bank situated in Wexford harbour. For some reason, this light does not appear on Trabas, one of the very few omissions I have come across in that wonderful resource. In fact, I have found nothing online about the light. 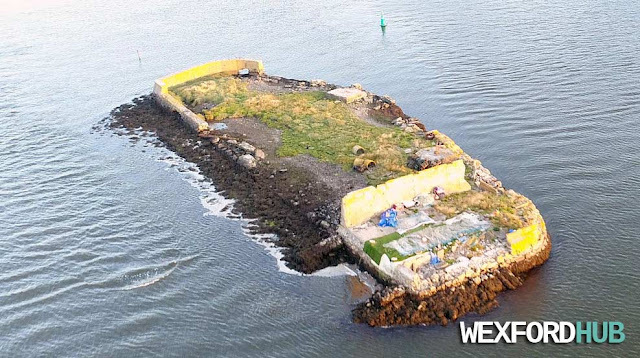 Regarding the Ballast Bank, itself, it is an artificial island, constructed so that ships might pick up or discharge ballast on entering or leaving Wexford Harbour. Most sources give the date of construction as 1937, though the architecture of Ireland site - which really should have the inside track on these sort of things - dates the island back to 1831. I'm no expert, but the light itself seems older than 1937. Someone should bring it in to the Antiques Roadshow. Below, a drone's eye view of the island, which I filched from Wexford Hub, an excellent site about all things Wexford.